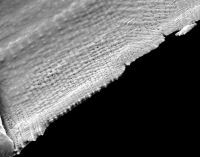 About the following SEM image galleries: This work explores a gap in the field of carbon materials. Metal catalysts have facilitated the synthesis of a wide range of graphitic materials for decades. At one end of the range is nearly ideal kish graphite, which is composed of large, flat, highly oriented graphene layers. Fullerenes, on the other hand, contain graphene of nanometer-scale curvature[2,3]. Between the extremes of conventional graphite and fullerenes, we may anticipate an immense variety of carbons in which the graphene molecules have an intermediate degree of curvature. The following galleries present an assortment of the intermediate-curvature graphites precipitated from iron, nickel and cobalt, so far.